"Symbolism is very compelling. Like images m our dreams, it invades the unconscious mind and touches us deeply— as long as were unaware of its iiresencc. if, in a heatjy-handed way, we label images as 'symbolic/ their effect is destroyed „Awareness of a symbol turns it into a neutral, intellectual curiosity, powerless and virtually meaningless." A while back I included this effect in a magic lecture, Rather than following the trick/explanation-trick/explanation format, I performed all the effects together as a show. I then explained them in the second half. I was fortunate to find two laypeople in the audience to assist during the performance part. About halfway through the explanation portion I asked if there were any questions. One of the women who had assisted during the performance part put up her hand. Since it's unusual to have a layperson ask a question in a magic lecture, I was curious to hear what she had to say. "Are you going to explain the one where you fused the two cards together?" she asked. This only served to underscore what I had already discovered from previous performances. This trick gets under people's skin. It really bothers them. It stays with them. Two spectators select cards. Each signs his card across the face. 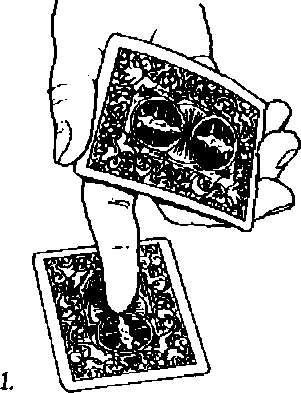 The performer then fuses the two cards together to form one card with a iace on each side. You will need a double-faced card, preferably showing spot cards on both sides so the spectators' signatures show up well. This card is on the face of the deck. The second and fourth cards from the face should be picture cards that match in color and value. (For the sake of the explanation, I'll assume they're the queens of hearts and diamonds). The two cards matching the double-facer should be removed from the deck. You'll also need a marking pen. You will now riffle force the double-facer, which is above the break, on a spectator on your right. When he stops you during the riffle, simply cut to the break and show him the bottom card of the top half. As you do so, place the bottom half off to the left face down. Take the top half face up in left-hand dealing position and hand the spectator the marking pen. Have him sign his name lengthwise across the face of the card in large letters so that the signature extends almost from end to end. Perform a double turnover and place the top card face down in front of you. (The audience will believe this is the signed card.) You want to avoid flashing the face of the card under the dealt-off card—that is, the other side of the double-facer—since you're going to force this card on another spectator in a moment. To do so, you must perform a hit double lift-type action to remove the facedown card from the face of the deck; you must also do a wrist turn as your right hand takes its card. In a continuing action, drop the now-facedown packet onto the tabled packet. When you drop the left-hand packet onto the tabled packet, place it injogged for about an inch. In the same motion pick up both halves. Your right hand then adjusts the deck into facedown dealing grip in the left hand. In squaring the cards, take a fourth-finger break between the two halves. Repeat the riffle force on a spectator to your left. This is handled exactly as before except that this time you place the lower half face u|> to your left, more or less in front of the spectator who is selecting the card. Have her sign the face card of the upper half as before. The audience believes the spectators have selected and signed two different cards, one of which is face down on the table and the other of which is on the face of the deck. Actually, they've signed two sides of the same double-faced card, while the tabled card is one of the red queens. 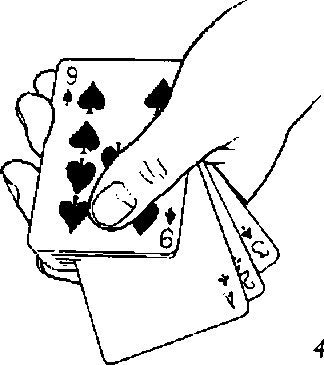 Take a left fourth-finger break under the two cards on the face of the deck. Take these two cards as a double in your right hand hi Biddle grip. Place the left-hand half face up on top of the tabled half. Turn your right hand palm up as you point with your forefinger to the tabled card, reminding the audience that this card was signed by the first spectator. (See illustration 1.) This action gives the audience a clear view of the backs of the two selected cards. This is quite an achievement since there is only oue selected card and it has no back. The next sequence will further reinforce the conviction that there are two different selected cards, each of which has both a face and a bach. 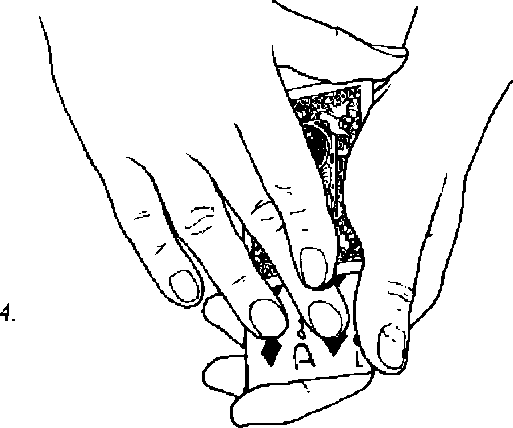 Place the double card face up in your left hand. (I use a straddle grip to ensure that the cards remain square.) Gesture with it toward the spectator on the left as you point out that her signature positively identifies this card as hers. At the same time pick up the tabled iacedown card in your right hand in Biddle grip. You're now going to gesture with your right hand toward the spectator on your right. In order to do this, you free your hand by placing its card face down on top of the face-up double in your left hand. (This is an application of Ascanio's concept of the in-transit action.) The gesture toward the spectator is accompanied by some comment about how he also signed his card. During this comment and gesture perform a pull-down move . with your left fourth finger to obtain a break above the bottom card of the three in your hand. Your right hand picks up the two cards above the break in Biddle grip and turns palm up to display the face of this double to die spectator on your right. At the same time your left hand turns palm down to point to the signature on the face (and to hide the face of the card it's holding). Illustration 2 shows this position. This gesture is accompanied by a comment about how his signature positively identifies this card as his. The above actions are all simple and easy and cake only a few seconds. You must, however, clearly understand the motivations in order to make them look casual and natural. The audience should be left with the clear impression that they saw you holding one signed selection in one hand while simultaneously holding the other signed selection in the other hand. The next sequence will further strengthen the impression of two separate cards, each with a back as well as a face. Your left forefinger now pulls the face-up double square with the facedown card as you simultaneously turn the hand palm up. Pull the top card back with your right fingers for about a third of its length and rub the newly exposed signature with your middle finger to stress its permanence. (Illustration 4 shows this action.) This sequence gives a perfect illusion of the two selected cards being face to face. Apparently you showed the face of the first selection at the same rime as the back of the second selection. Then you showed the face of the second selection at the same time as the back of the first selection. the top card to the bottom, apparently placing the two selections back to back. 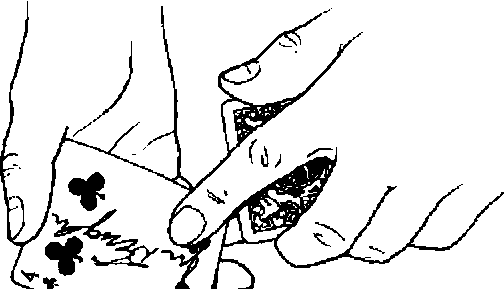 As you square up the packet, lilt up with your right thumb to obtain a thumb break under the top card. You will now apparently place the "two" back-to-back cards on the table in front of the second spectator. Rut, because the deck is in the way (due to your having strategically positioned it earlier), you must first remove it. Pick up the deck in your right hand under the cards it already holds and place it, still face up, in your left hand. 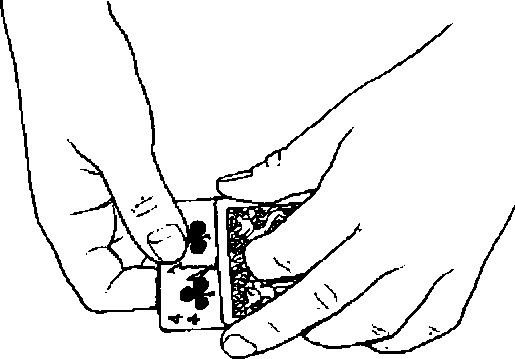 In reality, your left hand takes all the cards under the break, (This is another example of an in-transit action.) In the process, the face card of the deck will change from one red queen to the other, something no one will notice. Place the deck aside face down and start to place the right-hand "cards" on the table, but change your mind. Turn your right hand over to flash the first spectator's card, (This is done as a quick, off-handed action.) The audience will think they're seeing two back-to-back cards. Notice that the unloading move is triply covered. First, the action of picking up the deck is perfectly motivated and will therefore draw no attention. Second, the fact that the face card of the deck (apparently) never changes proves that no transfer of cards could have occurred between packet and deck. Third, the fact that you show you're still holding the two selections further proves that no transfer of cards occurred. Turn your hand palm down again and place the double-facer on the table in front of the second spectator. Have her place her hand on it. (As a small convincer, I always advise her to try not to spread the cards as she covers them.) Talk about the heat from her hand fusing the two cards together. After a moment, have the spectator lift her hand. Pick up the double-facer, but don't show the other side yet. Have the spectator feel the card and verify for the rest of the audience that there is only one card there. Then have her turn the card over. As soon as the effect has registered on the spectator, take the card from her and showcase the effect for the rest of the audience to make sure they realize what has happened. Despite your prior talk about fusing, you can expect a truly astonished reaction at this point. In fact, even when the spectator affirms that there is only one card there, I don't believe that the audience is yet thinking in terms of the two cards having become one. My reading of their reaction is that they're thinking, "Where did the other card go?" Since you've already told them that the two cards were going to fuse, you might wonder why they don't foresee the climax. The answer is simple. It's too impossible. You're left with a reversed card second from the bottom of the deck that you can straighten out at your leisure.